This document includes any financial aid a student is eligible for from a variety of institutional, federal, state, and private sources (e.g. grants, scholarships, loans, employment options). Together with resources available from the family, the total amount of financial aid options may meet the annual cost of attendance (includes tuition, fees, room, board, and allowances for books, transportation, and personal expenses). Families should use this information when comparing aid at different schools as it provides a total picture of aid. Allegheny competes in Division III of the National Collegiate Athletic Association (NCAA) and honors the Division III limitations. Academic and need-based financial aid are awarded without regard to students’ athletic abilities or sport participation. The FAFSA serves as the official financial aid application for all federal, state and institutional need-based programs — and we’re here to help you make sense of the process. 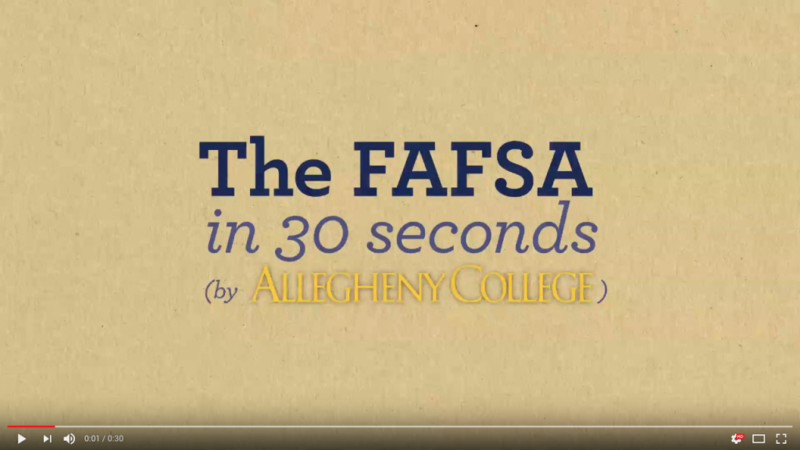 Visit our FAFSA resource page for videos, resources, and our staff’s “pro tips” for navigating the application process! All first-time financial aid applicants are encouraged to complete the Free Application for Federal Student Aid (FAFSA) between October 1 and February 15 in the year of application. Visit our FAFSA resource page for a description of the application process, links, videos, resources, and our staff’s “pro tips” for navigating the application process. Initial financial aid packages will be mailed based on the timeline above to admitted applicants who have completed the FAFSA, and on a rolling basis thereafter. The deposit deadline for regular decision students is May 1. Allegheny College cannot guarantee space will be available in the Fall freshmen class for students whose deposit is paid after May 1. Official financial need is defined as the Cost of Attendance (COA, total amount of annual educational expenses) minus the student’s Expected Family Contribution (EFC, amount calculated to be met through family financial resources). A financial aid “package” may consist of need-based and non-need-based financial aid from a variety of institutional, federal, state, and private sources. Typical types of aid include grants, scholarships, loans, and employment options. Together with resources available from the family, the total amount of financial aid options may meet the annual cost of attendance (including tuition, fees, room, board, and allowances for books, transportation, and personal expenses). For details on billing, meal plans, room rates and other student account information, please contact the Financial Services Office at 1-800-376-7075, or visit the Financial Services web site.